PetFence is the perfect humane containment system for your pet, it is simply the best product on the market. Our complete underground pet fencing system is high-caliber, made of the finest materials and is used by thousands of pet owners! We have worked with countless dog owners over the years, and we understand pets and your needs. We will work closely with you to determine the best containment area for your needs and for your pet. Our safe, humane and effective pet containment system is the best there is. We don't just install a system, we help you implement a new pet safety and containment way of life. It will have a tremendous positive impact on you, your family, and your pet. Call for a free estimate now, and say goodbye to chains, ropes, cages, fences and kennels. Our pet fence is Safe. The pet fence is HUMANE. 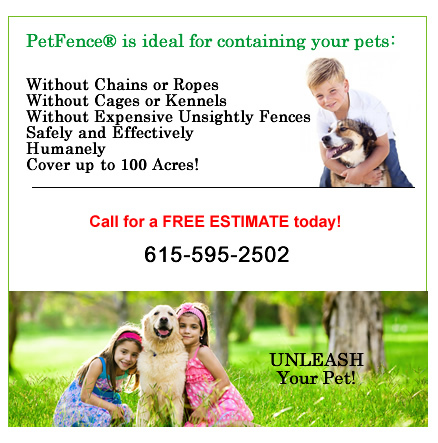 Call now to inquire about the best pet fence.